When you first start using the Operate Member Portal, you may already have existing contacts within the system. 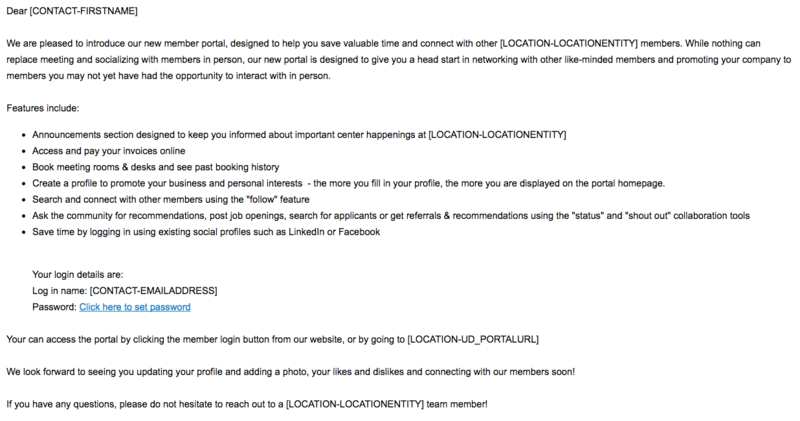 In this section, we will take you through how to invite your existing contacts to your Portal. Please note that everyone you want invited to your Portal needs to be added to Operate as a Contact and be associated to an Account. Learn more about adding contacts. To determine who should receive your invite, you can use Mailing List Filters. You can tweak these according to your preference; however, the example below should suit most situations. These filters will allow you to send a Portal invite to contacts who belong to a Customer Account, based in a specific Location that has an active Licence; while the Contact's Community Profile is Active and the Contact has not opted out of email communication. Account Record equals Account - This ensures that invites only go to contacts that belong to Customer Accounts and not to other types of contacts; such as Leads, Opportunities, or Prospects. Account Location equals The location from which you're inviting members - This is only required if you have multiple Locations configured within Operate and you only want to invite members from one of them. If you only have one Location or you want to invite all members across all Locations, you can ommit this filter. Contact Community Profile Active equals True - If you have decided to disable the Portal for External Clients, we recommend that you always set this filter, to ensure that they do not receive an invite. Contact Email Opt-Out equals False - This ensures that contacts who have opted out of email communication will not receive the invite. Follow the steps to create an Email Campaign, through which you can send your invite email. When sending your email, select one of the default invite templates (Invite Member to Portal or Register Template). You can create your own templates as well. [CONTACT-FIRSTNAME] - Inserts the first name of your member. [LOCATION-LOCATIONENTITY] - Inserts the name of your member's Location. [CONTACT-EMAILADDRESS] - This will be the member's username. [SET_PASSWORD_URL] - This field inserts a link which the member can click to set their Portal password and log in. As soon as you send out your Email Campaign, the invites will reach your members. Once you have invited your existing customers, you will likely want to keep inviting new ones and automate the process. In Operate, this can be done using workflows. You can configure a dedicated workflow that handles your contact onboarding process. Please see the Workflows section of our Knowledge Base to learn more. Go to Setting > General > Workflows. Name your workflow, choose a folder according to your preference, then select the Contact Module, under Step 2. Has Active Licence equals True - This ensures that the contacts you invite are part of a current customer's account. Invited from Portal equals False - This prevents the system from inviting contacts twice. Contact that have a checked Invited from Portal box have been added / created as a result of an admin member inviting them to the portal - in which case the contact record is created and added within the account they belong to or the Invited from Portal option is checked on an existing contact..
Onboarding Email Sent equals False - This ensures that your contact has not already been emailed with portal access information. Make the Workflow active by checking the checkbox, then Save. Once you have set up your Workflow Rules, view your workflow again and scroll down to Workflow Actions and click New. Operate will now ask you to select an action type. Please select Email Alert. Leave Is Workflow Timebased unchecked. Specify the email sender's name and address - Select the Record Email under Email To, so that the workflow will email your contacts using the email address they have on record. You can add other email addresses to send the invite to, as needed. Select the Template to Send - Here is where you can select a template you've created yourself or one of the default ones (Invite Member to Portal or Register template) You can edit the template if you like, using the option underneath. Enable the action by checking the box, then save your changes. When inviting someone to your Portal, you need to ensure that they receive the appropriate access level. To do this, please create a new action on the same workflow you have created to invite your members. This time, please select Field Update when asked to choose an action type. Select the Contact - Portal Access Level field. Set the Portal Access Level to the desired one - If you are inviting contacts with management roles within your client organizations, then you will want to set this to Admin so that in turn, they can invite their staff as Basic or Mid level users. Enable the action by checking the box. If you want your contact pages to mention whether they have received an invite email or not (and update this automatically), you can do so by creating a custom field and integrating it into the onboarding workflow. Create a custom checkbox field, called e.g. Onboarding Email Sent. Please read the dedicated guides to learn more about custom fields (the overall process and how to set them up). Leave the checkbox unticked by default. Add the field to your Contact page layout - Go to Settings > General > Customize > Contacts > Page Layouts and add the checkbox field to it. Read more about customizing page layouts. Go back to the Workflow and create a new Field Update Action - Select Contact - Onboard Email Sent as the field to update, then check the checkbox below. When this action triggers, the checkbox will also be updated on your contacts' profiles. In the end, you should have these four actions within one workflow: You can drag and drop them so that they trigger in the order you prefer - you can use any order, as long as your invite email action is first. The order below may be a good starting point for you. Go to Member > Contacts. Select the Contact you need to invite, by clicking on their name. Select a template - either one of the default invite templates (Invite Member to Portal or Register Template). You can create your own templates as well. Your Contact will receive a message that contains instructions on how they can set their password and log into the Portal. The password can be set by clicking on the link in the email. Your default invite templates (Invite Member to Portal or Register Template) contain all the necessary merge fields that will provide your new member with all the needed information. You can customize these templates or create new ones. [FIRSTNAME] - or any other field inserting your Contact's name, such as [FULLNAME]. [URL] - Inserts the Portal URL so your Contact know where to log in. [EMAIL] - This inserts the user's email address, as it will be their Portal Username. [SET_PASSWORD_URL] - This field will need to be set up as a link - when users click it, they will be directed to a page that lets them set their Portal Password. More information about the templatesetup is available in our article on Setting Up Portal Passwords.